As my kids have grown out of infancy, I’ve thought more and more about where the boundaries are around what I share here on my blog and on other forms of social media. I think about it quite a lot, and I’ve wanted to write about it many times, but I have backed off every time in fear of being too judgmental of other parents. I don’t want to add to all the noise in social media about how parents aren’t doing this or that right – I know intimately how completely overwhelming and crazymaking that can be when it reaches a certain pitch. So this is not an advice column – more of an invitation to work through this question with me, because it can be pretty tricky and confusing. How much is okay to share when it comes to our children? When it comes to photos, anecdotes, funny moments, hard moments, and when it comes to asking for advice or support? I like to write about my life (obviously) and I’m not one to bemoan the evils of social media too much. I am an autistic parent, which means that most like parents, I have a need to connect with other adults who share similar interests and experiences, but like most autistics (and introverts, for that matter), I have a limited amount of energy to socialize in person or on the phone (actually I have NO energy to socialize on the phone and would rather stab myself repeatedly in the eyes with a fork thank you very much). So for me, Facebook and Twitter and blogging are pretty much the best things since sliced bread. My kids are a big part of my life of course, and I’m with them almost all day almost every day. They take up a lot of my headspace. I love them and think they things they say and do are interesting and amusing. It’s natural for me to want to share some of that as I write about my days, I think, but the older they get they more I become aware that their stories are not mine to tell. So more and more lately I am trying to zero in on the incredibly fine line between writing about my life as their parent, and not writing about their lives as individuals who have a right to privacy but do not actually know what the internet even IS yet besides an endless fount of cool videos. When I think back on my childhood, my parents are part of my story, an integral part, a shaping influence, but they aren’t the main characters. I am. 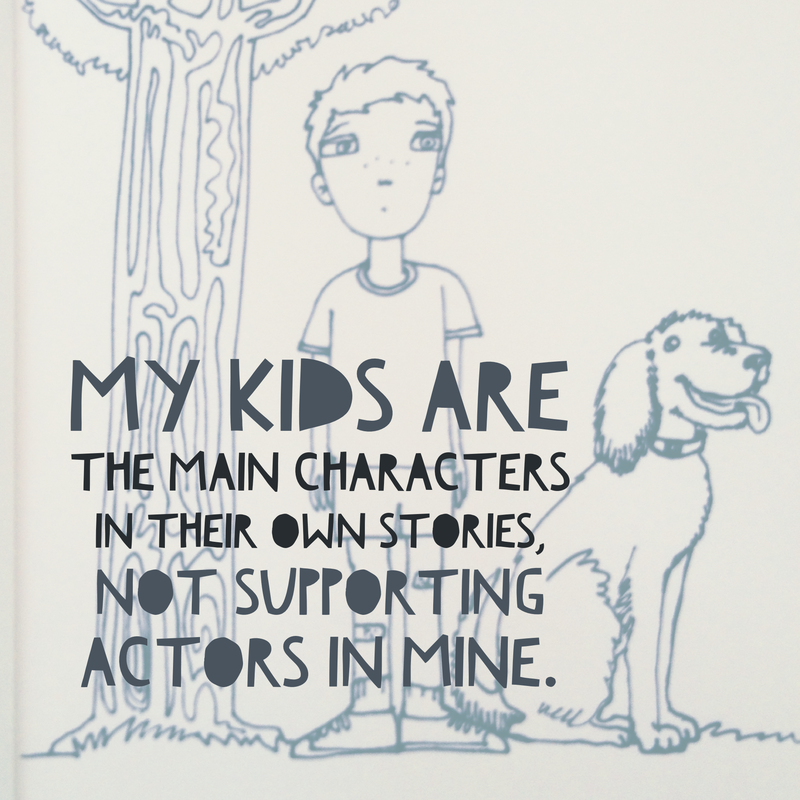 And my kids are the main characters in their own stories, not supporting actors in mine. So if you have noticed that I’ve been writing less and less about them here on my blog, it’s not just because my autism diagnosis has provided me with a lot of non-kid-related material, but also because I am deliberately moving away from oversharing. I suppose “Mommy Blogging” seemed less problematic to me when the kids were babies. New parents are on a steep learning curve. I know that I was quite frantic at times to reach out and ask whether I was doing anything at all right! And since babies pretty much all do more or less the same things (eat, sleep, cry, poop), I don’t think anyone’s child will mortified to learn that his mom once asked whether the consistency of his poop was normal. Hey, we all wondered about that at some point. And all babies poop. They aren’t terribly private about it either, I’ll tell you what. I don’t know when exactly they change over from Everybaby to little tiny people, but they definitely do. And then all the questions begin. What is okay to share? What isn’t? The business of protecting privacy while sharing our lives is so complicated and multilayered. I have been developing a rather convoluted system of levels of privacy. I share pics of the kids on Instagram, but I monitor who is following me. I don’t share kid pics on Twitter. I do share some funny kid stuff on Twitter but without using their names. I share photos of the kids on Facebook a little less than on Instagram, and I do share funny or cute stuff about them with their names. But I also have some different friends lists for different levels of intimacy. I do share photos and names and some anecdotes here on my blog, but honestly I’m becoming less and less comfortable with that stuff and thinking about how to move away from that while still writing about being a parent. Sometimes I wonder if I will lose followers who came here for cute kid stories and are getting bored of hearing about sensory issues or social justice or whatever else is on my mind. But hey, it’s my blog. I do still like to read about other people’s family lives though, is the funny thing. Other people have come up with other solutions to this privacy issue, like blogging under pseudonyms. I decided a few years ago not to be pseudonymous here because this body of work is important to me and I want to have my name on it. Some people make their blogs private, another good strategy, but I didn’t do that for the same reason cited above. Perhaps I could have invented names for the kids, but that would probably be a flimsy wall to climb if anyone wanted to find them. I like the idea of asking the kids’ permission to write about them, and probably will someday, but they aren’t old enough yet to understand what writing on the internet means. When I do write about my children, I try to keep in my mind the idea of them someday reading this. Or of their friends someday reading this. Or of their boss someday googling them and finding this. I never want them to feel embarrassed or as though I made their lives all about me. Though I would be happy for them to someday read this and know that I respected them, was proud of them, and felt privileged to stay home with them. I know I have not always managed this well, but I’m trying very hard to do better.